MALIBU, CALIF. – Aug 18, 2017 – East Coast Defender announced today that its new West Coast Design Studio in Malibu, Calif., located at 22333 Pacific Coast Highway, Suite 180, will open on Monday, Oct., 2, 2017. The new center is the first of its kind in the SUV industry to offer a turn-key custom design experience that enables clients to create a true, one-off Defender. It will be managed by Karissa Kreager, Client Liaison Manager for East Coast Defender. All East Coast Defender SUVs designed at the West Coast location will be built at The Rover Dome in Kissimmee, Florida. 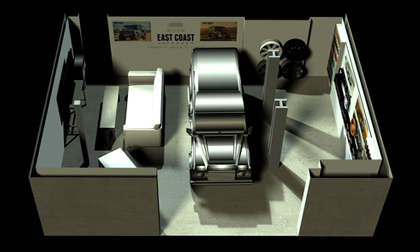 East Coast Defender’s Design Studio experience begins with the client selecting either a Defender 90, 110, or 130 chassis. During the configuration phase of the design process, the client will be presented with various paint, leather and string samples, as well as optional technology, steering wheels, gauges, winches, wheels, tires, etc. The Design Studio will include countless samples that the client can select, or customize based on their unique profile. Powertrain and exterior options, including engine options, seating configurations, bumpers and roll cages, etc. can be reviewed in the East Coast Defender Design Manual. The Malibu Design Center will be managed by Karissa Kreager, who’s been with East Coast Defender since 2017. She brings a wealth of experience in luxury retail sales, shopping and styling and has represented global fashion and designer brands. As the Client Liaison Manager, Karissa will be responsible for ensuring her guests experience a premium buying experience. She will provide a detailed and comprehensive buying journey that ensures her clients’ custom Defenders are built to their exact specs. She will also be a point of contact for her clients during the build process. The West Coast Design Studio will be similar to the new one that is currently open at ECD’s Kissimmee location. A finished East Coast Defender, which will be regularly rotated with different configurations, will be on display at the studio to give clients the opportunity to experience the craftsmanship of a finished vehicle. Clients in the area can choose to have their custom East Coast Defender delivered at the West Coast Design Studio, at the Rover Dome, or directly to their home. East Coast Defender was founded by three self-prescribed “British petrol heads,” brothers Tom and Elliot Humble, and Scott Wallace. Growing up in England, near the famous Lode Lane factory where the Defenders were produced, the three found themselves surrounded by Defenders throughout their childhood. East Coast Defender officially opened its facility in 2013 and has been building the world’s most celebrated, handcrafted Defenders since that time. Today, the company is based in Kissimmee, Florida, where every ECD custom Defender is built by hand in the company’s 21,000 sq. ft. production facility, called the Rover Dome.